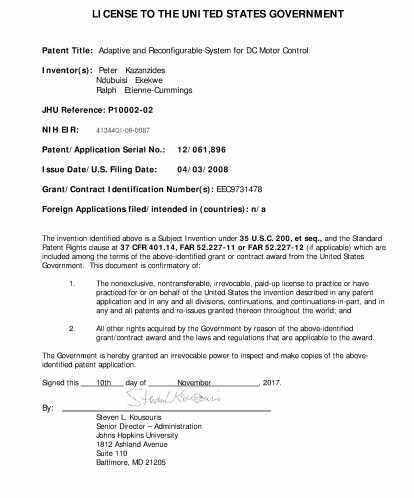 My Johns Hopkins University PhD work with the patent that came out of it has a major assignee: The United States Government via the National Science Foundation of the United States. I invented a special method of controlling the dexterity of medical robots, making such robots effective during minimally invasive surgeries. This patent is currently used by some medical device companies. The U.S. Government now has the rights to “make copies” as captured in the patent assignee file. Simply, it is now licensed to the United States Government which can use it for different national projects. I am steadily following your work and hope to partner with you soon. Congratulations my brother on this medical feat. ND, it’s a shame that I’m just getting to know about you and your giant strides. Congratulations! Keep up the good work. Thanks Nkem – we are all connected now.